A maquette is a small scale model, used to visualise and test ideas which provide the starting point for larger works. This informal mixed programme showcases the development of early-stage creation from young people and over 60s groups and choreographers. The featured choreographers Ben Duke, working with Three Score Dance Company, Khronos Agoria (The Brit School) and Jo Meredith, will discuss their creative process and exhibit the first versions of new work. These pieces will be presented alongside interesting new and developing works from emerging choreographers from the alumni of the National Youth Dance Company. Lead by Sadler's Wells Creative Learning department, this is an exciting opportunity that will challenge the perceptions of who can dance and where dance happens. 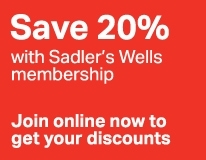 Sadler’s Wells continues its commitment to supporting artists and providing professional development opportunities to enrich the artistic process for emerging talent.